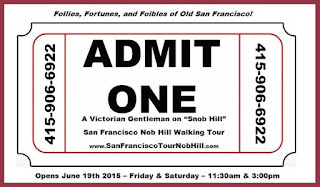 Spellbinder Entertainment – Theatrical Magic: My Victorian Gentleman on "Snob Hill" Walking Tour! 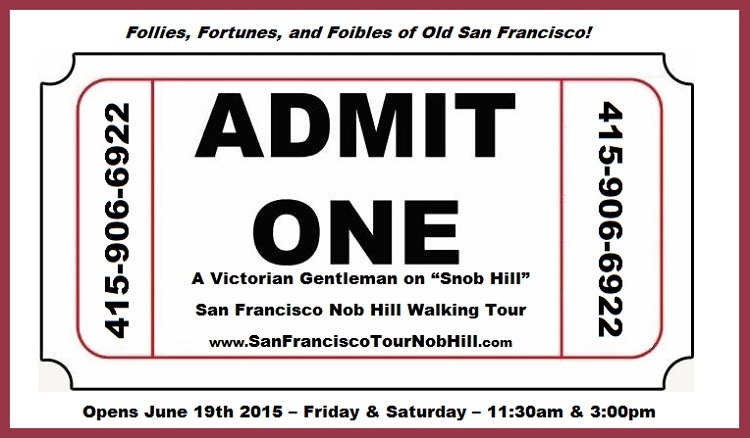 My Victorian Gentleman on "Snob Hill" Walking Tour! My walk gets underway in only two more days! Join me in exploring Nob Hill in my tour with a unique twist. Shhh... we’ve put a few 1/2 price admissions on Goldstar Events to celebrate our opening! The Follies, Fortunes, and Foibles of Old San Francisco! An intriguing stroll from historic Nob Hill to Union Square. Locals affectionately nicknamed the ultra-wealthy Nob Hill neighborhood “Snob Hill” it’s one of the most charming, picturesque, and historic areas in San Francisco. Your tour begins in scenic Huntington Park on the tip-top of Nob Hill. You’ll learn fascinating facts about Grace Cathedral, hear the chilling tale of the California Street Ghost Bride, and see where “Maltase Falcon” Detective Sam Spade lived. We’ll walk the sites where the infamous “Big Four” Silver Baron millionaire’s mansions stood before the 1906 Earthquake and hear all about their scandalous careers and feuds. You’ll get the inside stories of the landmark Fairmont, Mark Hopkins, and Stanford Court Hotels, and see where Alfred Hitchcock filmed his classic movie “Vertigo.” Find out what secrets hide within the Pacific Union Club, the former Flood Mansion, that survived the Earthquake and fires. We’ll walk alongside Andrew Hallidie’s Cable Car tracks as we stroll down the Powell Street hill, passing the mysterious “Family” Men’s’ Club and infamous Madam Tessie Wall’s home. You’ll end your journey at Union Square, hearing about the resident Ghost of the Chancellor Hotel, Big Alma’s Statue in the Square, the beloved St. Francisco Hotel, and the fate of Barbary Coast’s Maiden Lane.